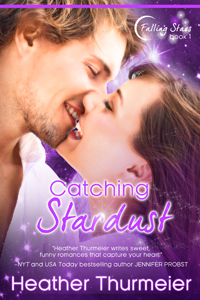 « Catching Stardust (Falling Stars: Book 1) — Cover Reveal! CATCHING STARDUST is now available in ebook form and will be coming to print by next week, hopefully! I’m so excited to offer a completely new kind of series to my readers. If you like my contemporary stories, I really think you’ll love my new paranormal. CATCHING STARDUST reads like a contemporary story set in current times NYC, but it has a little twist of the paranormal thrown in to make things more interesting. This isn’t your typical Vampire or Werewolf paranormal. (Though I love reading those!) Maia is something new, something unique… something completely out of this world! 😉 But that’s not all. CATCHING STARDUST is also an exciting adventure! I hope you’ll check it out and let me know what you think!! You can find your ebook copy at the following places and if you’re waiting on print, I’ll let you know as soon as it’s available! Maia’s been banished to Earth from her place among the stars as the eldest sister of Pleiades… and all because Orion won’t stop chasing her around the universe. Now Maia has to find her way back to the stars with only the help of hunky astronautics scientist Zander while staying hidden from Orion. Zander never expected the discovery of his lifetime to fall into his lap, but when Maia also falls into his bed, he knows there’s no way he can turn the goddess who has stolen his heart into a science project. With his best friend ready to sell him out for fame, her wannabe lover Orion chasing after her on Earth, and time running out fast, Zander must fight to keep Maia safe long enough to get her home. And don’t forget to add it to your GoodReads shelf! You can do that easily here: CATCHING STARDUST ON GOODREADS! Well, it probably wasn’t missing. Stars don’t usually just fall out of the sky, now do they? She studied the darkness above her. Millions of stars speckled the night, shining down on her. As she scanned the sky looking for her favorite one, she squinted her eyes as if doing so would somehow make sense out of what she saw. Maia squirmed, trying to get comfortable on the hard surface beneath her back. Now that she thought about it, why was she laying on something hard, damp and cold when her bed was warm and cozy with luxuriously soft sheets made of the finest cotton-silk blend stardust could buy? She definitely wasn’t lying in her bed. Had she fallen asleep in the park again? Sometimes that happened after a particularly delicious dinner or a party with too much wine—she’d wander into the park near her home to dip her toes into the coolness of Calliope Springs and she’d fall asleep on the damp grasses with her feet still dangling in the water. The feel of cold water washing over her calves and between her toes was incredibly soothing and would almost always lull her into a restful sleep. She wiggled her toes. No cool water slipped between them. Instead, her feet were bound in strappy sandals. I’m so not at the springs. She focused on the stars once more. Actually, now that she really studied them, the stars themselves seemed unusually far away tonight. And why were the twins staring back at her? She didn’t fall asleep to Gemini—she fell asleep and woke to Aries. Always Aries. For as long as she’d been one of the sisters of Pleiades, she’d always fallen into her dreams wondering how Aries could be so darn stubborn every single day of his eternity. Seems he made it his mission to live up to his hardheaded ‘ram’ reputation. Maia’s gaze darted around quickly scanning her area. Bed? Missing. Curtains? Nada. Waterfall just beyond her balcony? Neg-a-tive. No balcony either. A crystal clear view of the Pleiades constellation in the sky? Impossible. If she were on Pleiades how could she be looking at Pleiades? One, two, three, four, five, six… Damn it to Hades. She counted the dots of her constellation again. Only six stars were visible where there were supposed to be seven. Maybe stars do fall from the sky.